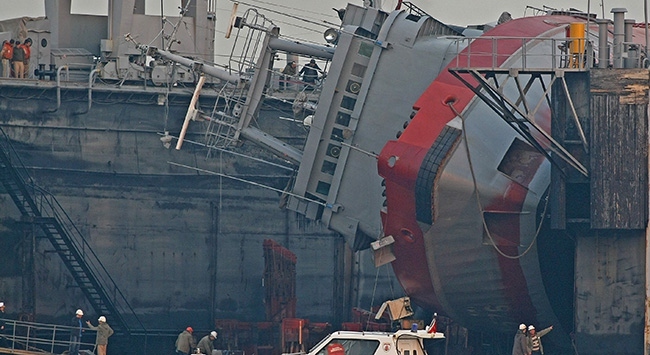 TCG Değirmendere capsized in the floating dry dock. Photo: TRTHaber. I was away for a short holiday and quite important and sad things happened in my absence. So this next few post will be an effort to update this blog. The tug A-576 TCG Değirmendere capsized inside the floating dock as she was being floated. 17 people injured and sadly 10 people was killed during this incident. The tug was being overhauled on the floating dry dock in Alaybey Naval Shipyard in İzmir. According to news reports, on 23 December 2013 as the floating dry dock was lowered into water to allow TCG Değirmendere and some other minor craft to be floated out some of the keel blocks moved causing the tug to list to the port side first. The signal for abandoning the ships was given but some of the crew tried to balance the ship by its ballast tank. The crew of the tug and a 10 strong salvage team was trying to stabilize the ship when she capsized to starboard side. 17 people who were on the tug at time of the incident fell to the water and were injured by falling objects. The 10 who died were inside the engine room and were suffocated when the fire extinguishing systems automatically started to filling the space with carbon monoxide. Both technical and juridical investigation has been launched to determine the cause of the incident. My condolences to the families of the deceased, may they rest in peace. Our sympathies to the families of the deceased. Another subject related to this and other incidents in the Turkish Navy is the cureent government’s attitude towards the navy and its admirals. Very sad indeed.